At the western end of Gower, the village of Rhossili, a gateway for walkers and beach lovers, lies above the dazzling sandy crescent of Rhossili Bay. The terrain west of the village is largely owned by the National Trust, and for most of the year there is a helpful NT information centre where important information such as tide times can be found. In the church there is a memorial to Petty Officer Evans, who was born here and perished with Scott in the Antarctic in 1912. If you walk to the 'Outer Head', then will probably see these birds. They are strong underwater swimmers and often remain submerged for long periods of time, searching for food. Dylan Thomas portrayed the high, open headland to the west of the village as ‘rubbery, gull-limed grass, the sheep-pilled stones, the pieces of bones and feathers’, and that exactly sums up the low-level ground environment, which, combined with exhilarating seascape, makes for agreeable walking on any sunny day at any time of year. It leads to Worm’s Head (from the Viking wurm, aptly meaning ‘dragon’), two rocky islands joined to the mainland by a narrow causeway accessible only at low tide and to one another by Devil’s Bridge, a narrow neck of rock. On the outer island, which rises abruptly to 200 feet, a booming blow hole throws up water visible from the village nearly two miles away. 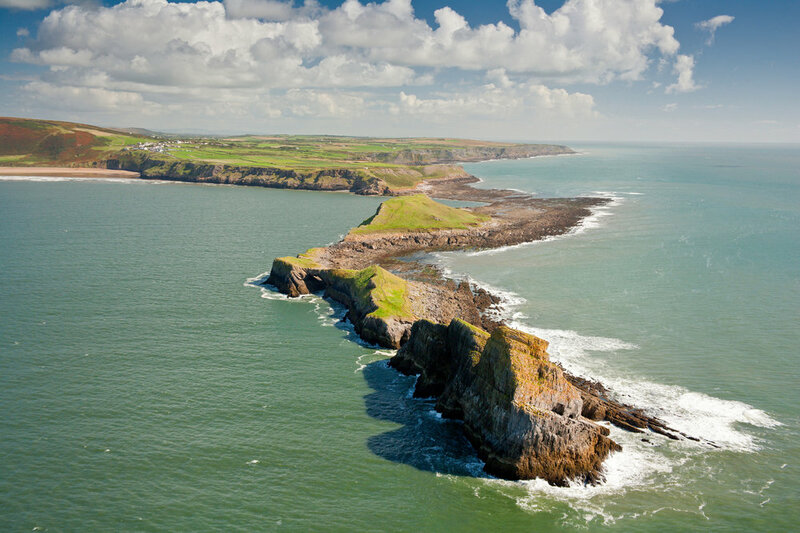 From the southern side of the headland there are magnificent views of the South Gower coast to Port Eynon Point, with cove after cove receding into the distance, battered by rolling waves. Below is Fall Bay, with its raised beach of conglomerate shells. Beyond it is secluded Mewslade Bay, dominated by the white limestone pinnacle of Thurba Head, which is crowned by the remains of an Iron Age hill fort. Rhossili Bay, the largest expanse of white sand on Gower, stretches for three miles to the islet of Burry Holms and is regarded as one of Europe’s great beaches. It is broken only by the skeletal remains of wrecked ships, most notably Gower’s best known wreck, the Norwegian barque Helvetia, which was driven onto the beach in a gale in 1887. The bay was carved out by the Atlantic Ocean from the imposing Rhossili Down, whose green bulk looms over the whole vast arc of sand. The sandstone Down, at 633 feet the highest point of Gower, is a favourite launching point for hang-gliders. On a clear day there are fine views of Lundy Island, and on a clear evening there are breathtaking sunsets.